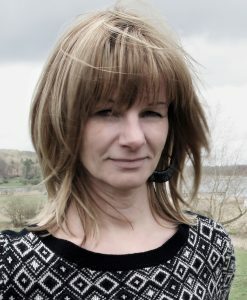 Today I’m delighted to welcome Sarah Dahl to my blog to help celebrate the launch of her latest book, The Awakening. 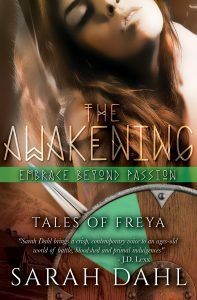 OUT TODAY, The Awakening is a passionate romance inspired by our Viking past. I’m a pantser as they say, and find plotting a long story from beginning to end very hard to pull off. Naturally, I’d just write from scene to scene and develop as I go, often not knowing the ending myself. For the stories in the Tales of Freya collection it was easier, as for short stories the plot and character arcs can be more straightforward. I always just start with an idea, something I want to happen, and then write with the flow until I’m happy. Of course, as a historical fiction writer I have to be firm and confident in the Viking environment and era. I read all the books and see as many sites as I can. My fave non-fiction is “Vikings at War” by Hjardar/Vike; it has brilliant detail and is the most extensive and visual book on the era I have seen. Also, every year I go to at least Haithabu/Hedeby here in Germany for a few days, to this once huge, Danish Viking trading town that is now a museum and open-air site by the Slien. The atmosphere of the reconstructed houses and pier just sparks creativity and a sense of the time. Soaking it all up, I just let my feet and mind wander, focussing on the big picture and then the details, imagining what stories could have happened in those narrow streets and houses. This year I became aware of the harsh winds, the never-ending gusts that penetrate the streets and houses, so much so that roofs don’t need smoke holes … the smoke from the fires just disappears through the walls and roof of the Viking town houses. So I tried to incorporate the harsh elements and their effects more in my story “The Awakening”, too. That’s a good question … I can do both; it all depends on the story and which character should tell the story, through whose eyes we should see and feel things. It doesn’t matter if it’s a man or woman, and I use both first person POV or deep third depending on what works best. In the Tales of Freya stories, I mostly use deep third. The view points can be that of men or/and women. For some reason I can work really well from a male POV. “The Current – A Battle of Seduction” is told from the warrior’s perspective on this seductive shield maiden, and I found it easy to slip into his skin. Whereas “The Awakening” is Ingrid’s story, and the next one, “Monk”, will even be told from three different POVs … I guess it’s all about gut feeling. With experience and craft comes a gut feeling for whose story I want to tell and how. Many thanks Sarah – and congratulations on your brand new book!